"Would you do it again?" That's an easy question to answer. It gets a resounding, "Yes!" And so does the other question that usually gets asked before or after this one, "Are you glad you did it?" The next one is "How have you changed?" and that is going to take awhile to answer. We know that what we have seen, heard, tasted, touched and experienced during the past year has already made an impact on us. But how it becomes woven into the fabric of who we are and the choices we make at any given point in our lives is going to take years to unfold. It's an unknown, but perhaps this is one of the most rewarding parts of this trip. A new adventure to be lived out. While in Casablanca we started preparing for THE question everyone asks, "What was your favourite part of the trip?" The truth is, we don't really think of it as a Trip. It was a Journey. And we have lots of categories of Favourites. We had fun putting these lists together, and you'll see that we didn't stick to any rules about number of favourites! - one camera case - that was it! Hi, it's Simon, son in the Dewilde clan, and I have traveled the world. The first rule that we had was to have fun all the time. Another rule that we had was to pack light. The third rule that we had was to collect as many coins and bills from other countries as we could. Our last rule that we had was to book all of our flights ahead of time. Do not worry if you travel, you do not need to follow all of these rules. One of the reasons that I like traveling is that it makes me feel so free. Another thing that I like is that I can go wherever I want. If I were to do this trip again I would stay longer in Australia. I would also stay for a shorter time in Bangladesh. If I were to stay somewhere for more then one year it would be The Philippines. The capital of the Philippines is Manila, and there is lots of smog. I would rather stay at our Los Banos apartment. I think traveling is amazing! You should try it too! Can you believe it? We're into T -10 days left on our journey. Our time in Niger has flown by and we still have much to do. Updating our blog has been hard since high speed internet has still not arrived in this country. However, there is no questionning the fact that we are thankful for each day that we are here. It means that the political situation remains stable enough for us to stay here. We continue to pray that the leaders of this country will choose to act in a way that is wise and just. While here we have met up with old friends and made new ones. What an incredible feeling to shake the hand of someone you worked alongside 13 years ago! We have been greeted with big smiles and lots of laughter - they love the fact that John is still able to greet in the local Gourmantche language. We've spent 5 days with ACEN, the church association we worked and lived alongside. Our plans were to spend some time in the village and do some workshops. The rains have been coming and everyone is waiting for an opportunity to plant so things are constantly in flux. Our village stay was not possible (if it rained while we were there we could be stuck for well over a week) but we did manage to do most of the training. John did a few workshops on hygiene and sanitation. Pam drew from the wealth of resources developed by her colleagues back home and gave a workshop on the work of deacons in the local church. It felt natural to be working with poster paper under a tree, chickens and goats passing by, and groups of small children huddled nearby watching all the action. A visit to our old village is still coming up (depending on the rain, of course). It just wouldn't seem right to leave Niger without having some millet and leaf sauce. When not with ACEN we spend three or four mornings a week with the Sisters of Charity. They have a child survival program that includes growth monitoring, a dispensary and weekly food distribution. The Sisters are gracious and generous, as always, and we have met many other interesting expatriates volunteering. Over 10% of the children we see are severely malnourished and are kept for 2 weeks in a small hospital/clinic run by the Sisters. This has been hard to see and led to many good discussions with the kids. Home schooling continues. We've been able to focus on a few art skills while here. Our friend Ardell is an art teacher, and she has taken us and her four children to visit some of the local artisans. One visit to learn soap stone carving and one to learn wood carving. As I write the kids are sewing wallets from local leather. Our families have been having fun together. We recently spent three days "on safari" in a national wildlife park. We've been staying in a family's house while they are on home service. Having a place to unpack is always a treat and we have been spoiled by having our cook from 13 years ago with us again. He didn't know we were coming so he was pretty surprised to see us! We also have a dog to look after for a few weeks. We still have a few more things we'd like to do here and a few more people to see. Can we squeeze it all in? We have met extraordinary people in many different parts of the world this past year. Unfortunately we often have to say goodbye without really knowing when we might cross paths again. Only once have we met the same people in totally different countries. Sorry, that’s not entirely true. We met up with John’s parents in Thailand and in Holland. But with people we didn’t know before this trip – it’s only happened once. And it all started in a candy store. We had just finished a tour of the The Rocks, a historical area in the city of Sydney, Australia. We stumbled across a candy store, aptly named Sticky, that produces homemade candy. You can watch the staff make the candy and then purchase it. There was quite a crowd watching two men pull and roll a long rope of candy when we arrived. When they finished cutting it into small pieces, they offered a free bag to the person who had traveled the furthest. We thought we might be in the running, but a young woman spoke up and said, “Burkina Faso!” She was rewarded the bag of candy. Burkina Faso is located in West Africa, and it borders Niger. If John and I hadn’t lived in Niger fifteen years ago, I’m certain we wouldn’t have known where Burkina Faso was. Turns out we’d been talking about Burkina Faso because we were still trying to find a place to study French during the two months we planned to be in West Africa. We seized the opportunity to ask someone who apparently had been in Burkina. I introduced myself and explained that we were looking for any leads on possible language schools. If the young woman said her name I didn’t hear it. She was with a group of people that included other adults and some very young children. They appeared to be in a hurry to get going. She hastily wrote two email addresses on a flyer I had in my pocket, and that was the end of our conversation. It wasn’t until we were in Bangladesh a few months later, and still looking for a language school, that I pulled out the addresses from “the woman at the candy store.” John wrote an email explaining who we were and how we came to have this email address. We weren’t entirely sure who we were writing to, and likewise, we didn’t know the name of the person who had given us the addresses! We didn’t hear back from anyone, so we pursued other leads and eventually registered with a centre du formation recommended by a friend who had studied in the same place. While in Egypt, we received a message from a woman named Bronwyn. She had received our email asking about French schools, apologized for taking so long to respond, and invited us to be in touch again when we arrived in Burkina Faso. Staying cool in Burkina has nothing to do with what you wear or the people you hang out with. It has everything to do with trying to beat the extreme heat everyday! When we arrived in Ouagadougou (the capital of Burkina Faso, West Africa) at 3:00am it was 33 C. We just about melted in the few minutes it took us to take off the jackets we'd been wearing on the plane. I don't know what the daytime temperature is - in fact, I don't really want to know - but it has to be in the 40's by the middle of the day (everyday!). One way to beat the heat is to go for a swim. There is a small hotel with a swimming pool just down the road from our apartment. It's only a fifteen minute walk, but by the time we get to the pool we often are tempted to do a Nestea plunge. I don't think the pool staff would be very happy if we did. We bought a membership for the pool, and are here three or four times a week. The electricity is often out for a few hours each day. Sometimes it happens when we are in French class in the morning, or in the afternoon when we are trying to do school work. If there is no electricity, we opt for school by the pool. Another way to beat the heat is to have short hair. Really, really short hair. Since the photo at the pool was taken, John has completely shaved his head. No hair! I'm not sure it really helps keep him cool because he has to wear a hat or risk getting his head sunburned. He looks "cool" though! Danielle sat patiently for 3 1/2 hours while having her hair braided. Each braid had "mesh" (fake hair) braided into it, to keep it strong. At the end of each braid there is a bead - 98 beads in total. She managed to keep them in for two weeks. We do have an air conditioner in our apartment, but the cost of electricity makes it too expensive to have it on all the time. Fortunately there has always been power during the night, so we always have it on and are grateful for a comfortable sleep. Electricity is like "pay as you go". Only once did we run out during the night, then we figured out where the counter is and made sure it's always loaded for the entire day. We are in French class five mornings a week. Danielle and Simon are in a class together, learning to sing in French, conjugate verbs, and all kinds of vocabulary. They seem to really enjoy the different teachers they have each day, and are slowly starting to put what they are learning into use with the people they meet. John and I are in a different class, and we too have great teachers. We're reviewing all the things we learned 15 years ago and, of course, learning lots of new things too. The director of the French school, Jacqui, has been an extraordinary host. She found us a place to stay that is only a two minute walk from the school. She also made arrangements for someone to come and help us look after the house and cook the main meal of the day. She's taken us on various "field trips" in and around Ouaga, and she even acted as "tour guide" when we traveled to the city of Bobo-Dioulasso for a weekend. Bobo is in the western region of Burkina Faso. It is a little bit cooler than Ouaga. Two highlights (we never just have one!) of our weekend: playing in the waterfalls near Banfora. We would have liked to have stayed the entire day but Jacqui had other sites for us to visit. The second highlight was seeing wild hippos in Lake Tengrela. There are about 20 who share the lake with the fishermen and villagers who live in the area. We were able to see a group of 5. We were only able to see the tops of their heads and their ears when they popped their heads' up out of the water. During the day they stay submerged in the water. At night they stay in the bush eating grass and other plants. As we were leaving the area, one hippo gave us a great big open-mouthed smile (or maybe it was a yawn). Simon said, "wow, that's a once in a lifetime thing to see!" Thanks for all the e-cards, emails and birthday wishes that were sent to John and I recently! John's birthday fell on a national holiday in Burkina. Instead of giving us a day off, or taking a day off herself, Jacqui organized another field trip. One of the sites we visited was a small farm where a French couple have been raising goats and making goat cheese for ten years. John and I love goat cheese (mainly because we are lactose intolerant and can't eat other cheeses). So, buying fresh goat cheese was a treat. I've had my birthday this month too. The day before, we went out for dinner at a restaurant with fantastic thin-crust pizza. We tried to go to a dance performance at the French cultural centre, but got the location wrong. On my birthday we were invited out for dinner with "the candy store people." I'm going to save that story, and who they are, for another posting. Madrid was not on our original list of places to visit, but when we had to pass through on our way from Egypt to West Africa, it seemed like a good way to practice the Spanish we had learned earlier in Nicarauga. Madrid is a beautiful city teeming with cafes, restaurants and art galleries. Stuff any 9 or 11 year old would love (or not). Our 7 days there were full, as always, and we had an interesting and pleasant time there. Here are a few of our impressions – things that surprised us and highlights. - Eating dinner at 9:00 pm is hard to get used to. - Cafes not opening until well after 8:00 am or 9:00 am is hard for John to get used to (Starbucks opened early though). - Stuff is expensive. Spain is not the poor cousin in Europe. - When you order a hot chocolate you are not supposed to drink the melted chocolate syrup they give you. It is for dipping churros in – great once you figure out the system. - Getting just a "regular coffee" is next to impossible unless you go to Starbucks. - Iberian Ham and the Museum of Ham – Mardrillenos love their ham and so do I. - Strawberries grow on trees. Not really but Madrillenos believe this is the case. Their symbol is a bear trying to reach up a strawberry tree. - Bull fighting is hard to pin down but is very big in Madrid. We didn’t go but met some students who did and they were disgusted. We saw a bit of it on TV and it seemed like a dance – we didn’t see the gory parts though. - Our Spanish language skills are barely past functional and the kids did learn a tonne. They often had to add a word for us. Now it's time to pack our bags and prepare for West Africa. Allons-y! Egypt was completely overwhelming and awesome. Simon had put Egypt on our itinerary because of years of study at school. We all came away with a new appreciation and interest in Egypt and its past. Pictures, since they tell a thousand words, may be the best way to summarize our time there. Here we are at the 4,500 year old Pyramids in Giza - we were lucky enough to walk into the Great Pyramid next door to this one. This should give you some scale of the pyramids - a great puzzle for a civil engineer. Manar, our guide in Cairo, was a wealth of information. Simon is on overload already. After an overnight train to Aswan we boarded a boat and were off to see the temples along the Nile. Here is the temple of Philae, rebuilt stone by stone on higher land after dams were built on the Nile and flooded its original location. The Temple of Kom Ombo - the heiroglyphs and images kept us all fascinated with their stories. Imagine all this in colour as it would have been 2,000 years ago. The boat was a wonderful reprieve from the heat and the kids enjoyed the company of a few other children. The Valley of the Kings - 62 tombs found so far and there is much left to explore and discover. We entered three of the tombs and each was unique and fascinating (no pictures allowed though). It was in this area that King Tut's tomb was discovered. The Temple of Queen Hatshepsut - if you get a chance to read her story in a recent National Geographic you should. The movie is coming out soon. After Luxor we made a quick hop to Sharm el Sheik and a morning swimming with the fishes. That same night we climbed Mt Sinai and started our 300th day on the road watching the sunrise. After 10 days we were back in Cairo and our amazing history lesson was complete. Acutally this introduction just whet our appetite and perhaps one of us will become an Egyptologist. When we stepped off the Ryan Air plane (that’s a story in itself) in Holland it felt like we were coming home. Uncle Rick, John’s brother, and his family live in Eindhoven. We stayed with them for more than two weeks a couple years ago, so stepping back into their home felt very familiar. It was a familiarity and an “at home” feeling that came at a good time on our journey. We can see the finish line, so to speak. Yet, there are still lots of adventures, and the need for the same energy and stamina we’ve needed for the past 9 months, to tackle what still lies ahead of us. Somehow sleeping in a familiar room, sitting on a familiar couch, and still knowing where the candies are hid in the kitchen cupboard, gave us an unexpected boost. Danielle, Simon and their cousin Joram were inseparable the last time we were here – except they didn’t sleep in Joram’s room. This time all three slept in the same room, and except for the times that Joram was at school, the three cousins were playing together. That was an extraordinary gift for Danielle and Simon. They’ve been missing their friends at home so someone to play with full-time came at a good time for them. They also had the opportunity to go to school for a morning with Joram. There was a special Easter breakfast and gym class. Fortunately the kids didn’t need much Dutch and the nervous teacher didn’t need much English to get through a morning of eating and playing. It is worthy of note that Joram did very well as a simultaneous translator during a short story time that morning! Danielle and Opa out for a bike ride. We spent Easter weekend further north, close to Steenwijk, with John’s parents, Rick’s family, and more relatives! As you can imagine, there was lots of coffee, biking, swimming at an indoor pool, Easter Egg hunts, and chocolate. The holiday park was next to the national Weerribben park that consists mainly of peat bogs. 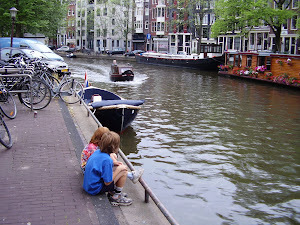 We spent one very pleasant late afternoon and evening boating about the canals. We weren’t able to fill our bags with all the treats we usually bring home after a trip to Holland; however, tucked into our hearts is a little piece of “home” that we’ll savour during the coming few months. The Harry Potter movies were filmed in London. I have read all the books and seen all the movies that have been made. I went on a Harry Potter walk and learned some unique facts. - The Leaky Cauldron is actually an optometrist shop and the only part that you’ll remember from the movie is the round door. - One of JK Rowling’s friend’s last name was Potter and she liked the name Harry so the character of Harry Potter was born. - Gringott’s Bank was filmed in Australia House. We tried to get in to see it but the area is closed to the public. - The names Snape and Hermoine are the names of villages in England. - When JK Rowlings thought of platform 9 ¾ in King’s Cross Station she was actually at Euston Station sitting in between platforms 9 and 10. King’s Cross Station is where her parents first met. The London Eye was my favourite thing in London because I like going up high and I got to see the city with my Grandma and Poppa. You can see the Eye from many places in London. To get out tickets Poppa had to stand in line for over half an hour. We looked at several street performers, mostly people who were pretending to be funny statues. We went through security and got on the pod with about 20 people in total. The ride takes about 30 minutes to go all the way around. One of my favourite parts is when we were at the very top. From the top you could see Buckingham Palace, Westminster Abbey, and the Big Ben clock tower. My other favourite thing was when they took our picture. Simon and I made funny faces – we did not buy the picture.